Did you know that Prestige Marble & Granite specializes in unique and rare natural stone? These “designer” stones are sourced from quarries around the world, in places such as Brazil, India, Ukraine, Turkey and Africa, to name a few. Most natural granite slabs suitable for use in countertop applications, regardless of their rarity or abundance, have similar inherent qualities of strength and durability, but exotic granites are rarer in terms of color, pattern and beauty. While the more abundant granite varieties often have more uniform and consistent veining and patterning, designer or exotic stones will generally have more irregular patterns, also known as “movement,” which is desirable. Colors in high-end designer stones are rarer, or even one-of-a-kind. It is the rare, precious materials of our exotic collection that will ensure a unique look for your home improvement project, nearly guaranteeing a kitchen countertop or bathroom vanity not seen anywhere else, or certainly not in your area. Here’s a look at four exotic granites from our designer collection. Keep in mind that pictures don’t exactly convey the true colors and beauty of the granite, and patterns within a color will vary from slab to slab. We invite you to visit our showroom to view these unique beauties in person! Dramatic and stunning “Fusion” granite from Brazil has swirls of blues, grays, greens and oranges, highlighted by cream fine veins. It reminds us of viewing the earth from space! Extremely hard and durable, Volga Blue granite from Ukraine is a stunning stone that has earned its reputation as one of the most attractive stones on the market. Dense, black mineral deposits give an effect that almost looks like shattered glass, but it’s the exquisite blue mineral deposits that give this stone its name. This extraordinary Audax polished granite from Brazil mixes rich chocolate and glittery gold tones with warm charcoal gray hues, broken up with chunks of light-reflecting quartz. Magma Gold from Brazil has a stunning combination of black, charcoal, rusts, and glittering gold streaks of high variation. This natural stone demands being the center of attention in any room with its dramatic veins and true organic beauty. These four stunning granites are just a few in our extensive collection of designer stones! We offer the largest selection of the highest quality, rare and exotic natural stones available in Middle Tennessee – we would love for you stop by and browse any time. The change of seasons often has us craving a color change in our interiors. 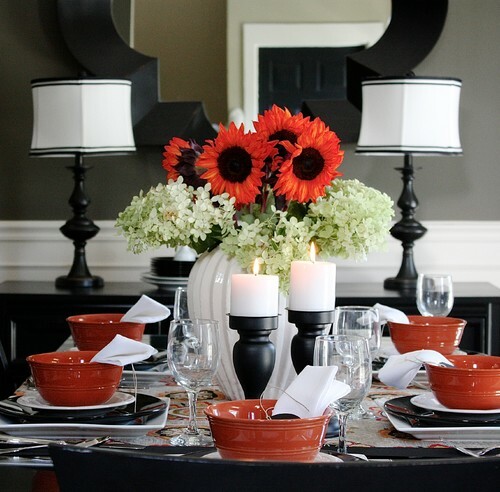 Fall warrants spicy, warm colors that are rich and cozy. From hues of chocolate brown and golden yellow to burnt orange and lipstick red, here’s a look at how pops of autumnal color can add intensity and depth to your interior spaces. 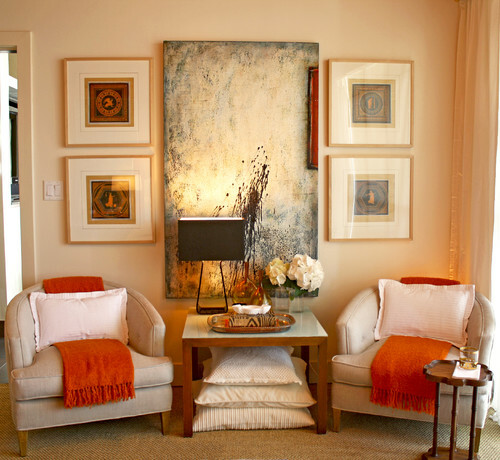 Spicy pumpkin colored throws are a perfect autumn accent in this creamy colored room. Whether your goal is to celebrate Autumn or Tennessee Football, the bright pops of orange in this neutral bath fill the bill. 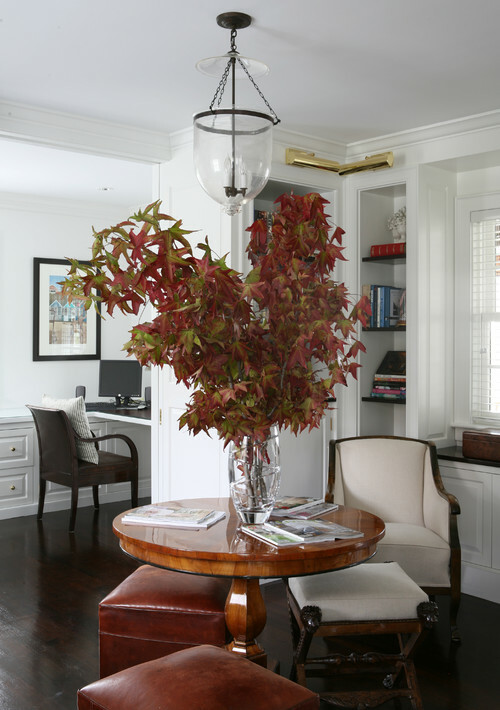 Instant autumn color: bring in autumn leaves still on the branch and place them in a vase for an easy (and pretty!) temporary centerpiece. Get creative with what you have on hand. 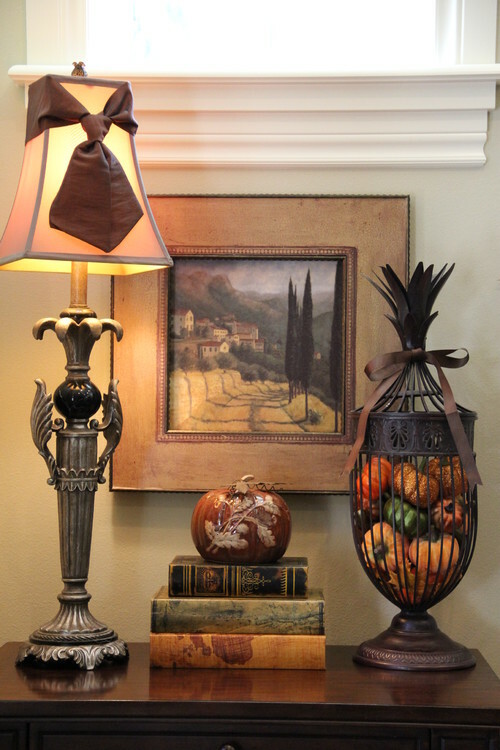 Create an autumn display on a sideboard, buffet or credenza, with perhaps just a few props from the hobby store. 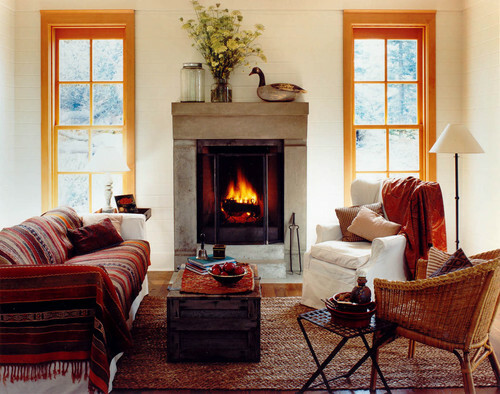 Drape a sofa with a richly colored blanket in spicy hues for an instant punch of autumn color. This simple, yet elegant table proves you don’t have to pull out all the bells and whistles to make a stunning fall statement! 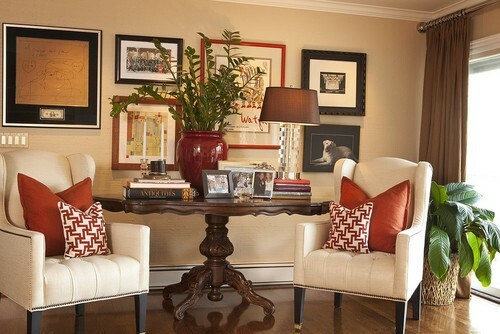 Use robust red and brown accents with a predominately neutral palette to bring richness and depth to a space. A powder room or guest bath is a perfect place for having some fun with your decor. 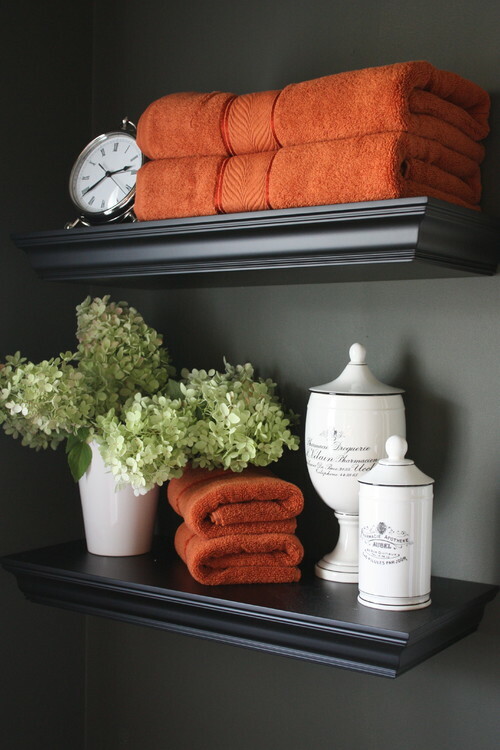 Switch out towels temporarily to seasonal colors and include some fall-scented candles.